for all your locker room and spa supplies. Tamper-proof your amenities at the vanity and showers. Wholesale ordering is only for businesses using our products inside their facilities or for resale to their clientèle. When ordering you must supply a business name, federal tax i.d. number, and the business address. We do not ship wholesale orders to residential addresses. New customers will be contacted by Sports Solutions upon receipt of their first wholesale order to verify eligibility for wholesale purchasing. If your business name is not listed with the Better Business Bureau in your area, you will be required to fax us a copy of your resale certificate. Customers who are are not eligible for WHOLESALE purchasing must order from our RETAIL shop. 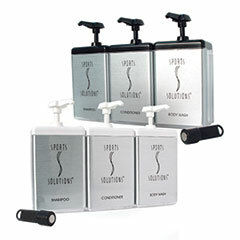 Orders for dispensers only will be charged retail pricing when the customer does not use Sports Solutions' liquid products inside the dispensers. The minimum order on wholesale purchases is $100.00 per order. Orders that are less than $100.00 (other than parts orders) will incur a $15.00 service charge. Freight Charges: Freight charges are pre-paid by Sports Solutions and will be added to your invoice. ShopFactory shopping cart software powers SSI Wholesale Products. All-in one eCommerce software and shopping cart.